It's not oil prices that impacted the company, it's the uncertainty about what Andeavor's parent company will do with it. Shares of pipeline and storage specialist Andeavor Logistics Partners (NYSE:ANDX) declined 12.9% in December, According to S&P Global Market Intelligence. The largest culprit for the move was the decline in oil prices and the market in general. Longer term, though, there is a lot of uncertainty regarding what its parent company will do with the business. 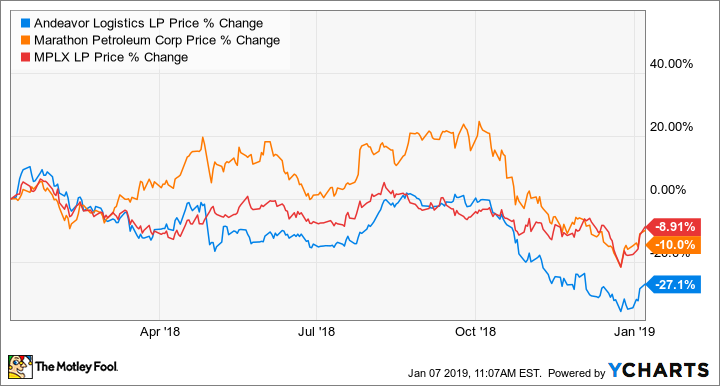 Aside from Wall Street thinking that Andeavor Logistics' stock is less valuable, the recent sell-off and oil price decline isn't going to have much of an effect on the business. Ninety-five percent of the company's revenue comes from fee-based contracts with little to no exposure to commodity prices. So any change in prices has little to no effect on the company's earnings reports. The thing that should have investors concerned is that Andeavor's future looks incredibly uncertain right now. Marathon Petroleum (NYSE:MPC) purchased Andeavor Logistics' former parent, Andeavor, last year. Like Andeavor, Marathon has its own subsidiary partnership in MPLX (NYSE:MPLX). Both of these subsidiaries serve the same function of supporting Marathon's refining and marketing businesses with oil and refined-product logistics. When Marathon took control of Andeavor, it immediately started making significant changes. One was to stop growing the partnership's payout. Marathon would like to run Andeavor Logistics much more like MPLX, which means lower debt levels and higher amounts of retained cash flow. While I'm speculating here, the long-term solution will likely be for MPLX to acquire Andeavor Logistics. Andeavor Logistics is slated for several changes now that it is under new management, regardless of where oil prices go from here. Those changes are probably better for the long-term health of the business, but investors who have become accustomed to its extremely high yield will likely be disappointed. Personally, I think the company will look to merge the two businesses. That merger will likely be more favorable to MPLX because it is the stronger of the two. For anyone tempted to buy Andeavor Logistics with its 12.5% distribution yield, it's probably best to wait and see how this situation with the parent company shakes out.